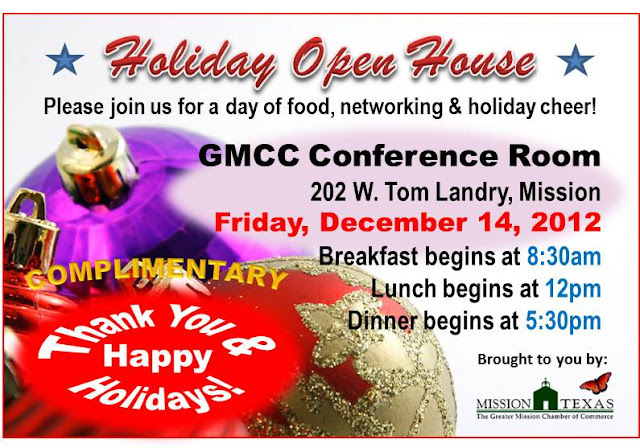 The Greater Mission Chamber of Commerce invites the public to stop by between 8:30 am and 7 pm on Friday, December 14, 2012 to visit with the Staff and Members. Last year's Holiday Open House was a great success, and an opportunity for the community to learn more about the Mission Chamber. The event is open to everybody in the community, including visitors. The Chamber will serve breakfast, lunch, and dinner throughout the day.